Integration is a big challenge in large, industrial systems. In the past, industrial system integration focused on devices, networks and other hardware – the physical layer. Software was configured and contained within specific devices for the most part. With the advent of the Industrial IoT (IIoT) with its ubiquitous network connectivity and virtualization provided by edge/fog computing, the system integration challenge has moved up the technology stack to the software that runs on the physical layer [“Software is eating the world” - Mark Andreeson]. The functionality of the system is now defined by both the physical layer and the software above, but the system value and the integration challenge has shifted to the software. IIoT systems of course need to have well-integrated physical implementations with devices and networks, but the software applications are now inherently distributed – spanning multiple compute nodes with data flowing between them. The devices and networks are necessary, but no longer pre-eminent. Much like Infrastructure-as-a-Service in cloud computing, the IIoT edge is approaching a similar compute model. Or at least a commoditization and simplification of the physical layer in the compute stack. With this software integration becoming the focus, data connectivity between the applications becomes critical to streamlining software integration. 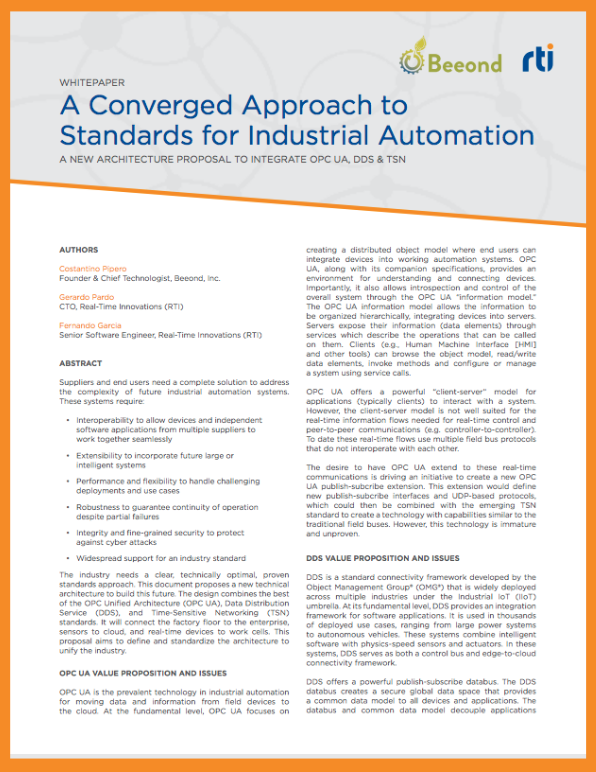 The IIC – with its Industrial Internet Connectivity Framework – lays out a reference architecture for connectivity, and suggests core standards to use including DDS and OPC UA. These standards both address integration, but diverge in focus between physical layer hardware (OPC UA) versus software (DDS). OPC UA grew up in a world where the primary challenge was to integrate devices and hardware, and it does this well. 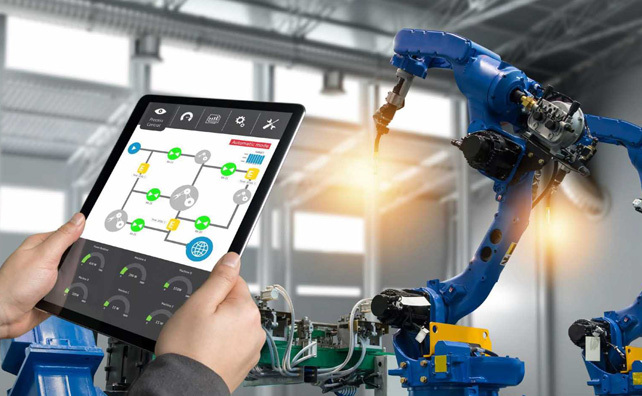 A software application is contained within a single device, and the systems are smaller in scale (a manufacturing workcell) than what is needed in the edge-to-cloud IIoT systems now entering deployment. 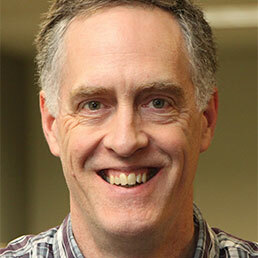 DDS grew up in complex, software-centric systems. Applications are larger than a single compute node and have to be integrated via data-flow and service calls. Development teams are often large, scattered and need to keep their interfaces well-defined. This is the software-centric direction for IIoT systems now. While IIoT system architecture has shifted to address the value and integration challenge of software, the physical layer needs to also be well-designed and integrated. DDS uniquely streamlines the data and software integration challenges, and OPC UA brings very valuable domain information models useful at both the physical and software levels. For this reason, industrial organizations are exploring how to bring together the best of both DDS and OPC UA. At RTI, working with OPC UA experts Beeond, we see two effective approaches: the Integration Gateway approach and the Converged SDK approach. In this approach, DDS is the core integration bus for software-centric systems, streamlining the integration of distributed software applications and the sharing of data and service invocations between them. To integrate OPC UA devices and applications like HMIs, these systems use the newly standardized OPC UA-DDS Gateway. RTI offers an implementation of this standard as part of its Connext® product line and initial deployments are underway in industrial systems. Recently the OPC UA community realized they needed an open alternative to all of the proprietary fieldbuses and control buses, and also needed to move beyond just a client-server model. They developed the OPC UA Pub-Sub standard. It is a very simple connectivity framework with plans to leverage the emerging TSN ethernet standard to provide guaranteed bandwidth and latency. Industrial systems of the future will be much larger in scale and defined by dynamic, distributed software. Data flow shaping like deadlines, priorities, reliability, liveliness and history are needed from edge to backend in different combinations. This requires a publish-subscribe model with flexibility to scale – securely and with tunable performance – to address these varying needs. DDS has proven itself in thousands of projects like this. For the deterministic data flow needs at the edge of industrial systems, the emerging TSN standard holds great promise. Replacing the myriad motion-control and safety system bus standards with a single, widely-adopted TSN-based standard would open up the ecosystem for vendors and system integrators. There is still much work to be done though. System level configurations interfaces are still undefined, OS network stack mappings to the TSN Layer 2 standard need to defined, and TSN endpoint configuration interfaces to the system level configuration tools are in their infancy. The Object Management Group® (OMG®), the DDS standards body, is defining a mapping of the DDS configuration model (QoS) to TSN. Initial implementations exist now. DDS can be a publish-subscribe standard that spans deterministic, TSN-based edge networks back to the control centers and cloud instances. OPC UA is the prevalent technology in industrial automation for moving data and information from field devices to backend applications. It offers a “client-server” model for applications (typically clients) to interact with a complex system (implemented as a set of servers). Importantly, it also allows introspection and control of the overall system through the OPC UA “Information Model” (IM). With its Companion Specifications, OPC UA provides the information models needed for semantic interoperability in industrial automation. So we could bring the best of both DDS and OPC UA together, combining OPC UA’s client-server model and domain information models with DDS’s proven publish-subscribe. Figure 2. Converged SDK Approach: On the left is the current client-server and publish-subscribe stack for OPC-UA. On the right is a proposal to integrate DDS as the publish-subscribe stack for a Converged SDK solution. Beeond and RTI have captured the concept of a Converged SDK in a joint white paper. Figure 2, from the white paper, captures an alternative to the OPC UA pub/sub model through a proven, extensible DDS design. It will scale to thousands of nodes, eliminate dependence on servers, provide flexible physical-layer implementation and enable fine-grained security. As shown on the right, the OPC UA object-oriented model is merged with the DDS data-centric, publish-subscribe model. With this design, both client-server and pub-sub will be based on years of field-proven technologies and standards with industry-leading capabilities. Which of these two integration approaches makes sense for a specific industrial system depends on use cases and overall system requirements. In fact, these two approaches can be used in the same system as needed. Regardless, combining the software-integration strength of DDS with the device-integration strength of OPC UA is a promising path forward.